Watch Arkansas’ candidates for governor debate live on AETN, on Thursday, Oct. 16 at 3 p.m. EDT, featuring Asa Hutchinson (R), Mike Ross (D), Joshua Drake (G), and Frank Gilbert (L). Livestream courtesy Arkansas Educational Television Network. Four Arkansas politicians will take to the debate stage on Thursday afternoon, each to make the case that he is the best replacement for that state’s enormously popular outgoing governor. 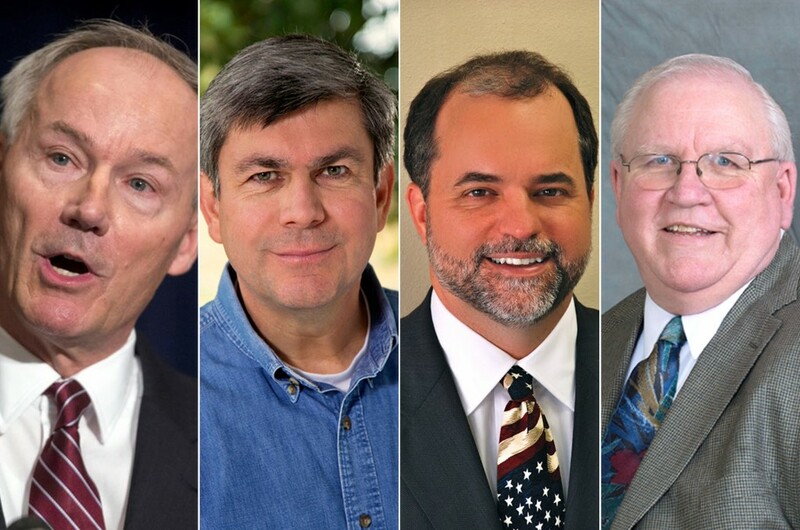 Asa Hutchinson (R), Mike Ross (D), J. Joshua Drake (G), and Frank Gilbert (L) will meet on the University of Central Arkansas campus at 3 p.m. EDT on Thursday, Oct. 16. The Arkansas Educational Television Network and AARP Arkansas co-sponsor. Steve Barnes, host of AETN’s “Arkansas Week,” moderates. Arkansas journalists Michael Hibblen of KUAR, David Goins of Fox 16/KARK, and Rusty Turner, of the Northwest Arkansas Times, will ask questions of the candidates. The debate will be re-broadcast across the state and online at 9 p.m. EST that night. Gov. Mike Beebe, a centrist Democrat who has enjoyed consistently high approval ratings, even as his state’s voters moved steadily toward the right, must step down due to term limits. This has opened the field to a surprisingly competitive race, competitive in part because of the contentious Senate battle also going on in the state. Millions in outside contributions for that contest may spill over into the gubernatorial campaign. Polls show Hutchinson and Ross, both former Congressmen, all but tied, with a slight edge for Hutchinson. Health care is a central concern to Arkansas voters, and both major party gubernatorial candidates have come out against the Affordable Care Act. Ross was one of three Democrats in the House to vote for its repeal. But he also supports the state’s Medicaid expansion, including its “private option,” which Beebe championed. The candidates will also likely spar over a ballot measure to raise the state’s minimum wage.